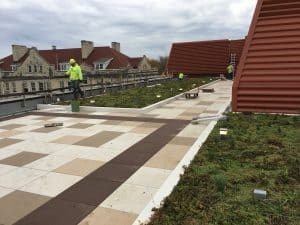 WAUKESHA, Wis. – A nursing and physics/engineering facility at Carroll University has set a new standard for energy efficiency and sustainability on the Waukesha campus, earning the school’s first LEED® certification while also featuring the city’s first green roof. 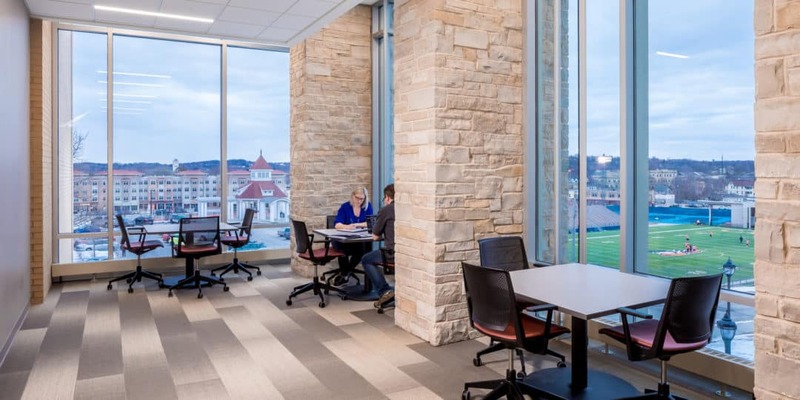 Part of Carroll University’s strategic mission to deliver a strengthened academic experience, the new 38,224-square-foot Doug and Nancy Hastad Hall features state-of-the-art laboratories, simulation nursing labs, classrooms and collaboration spaces. The academic center is the second phase of a BWBR-led campus redesign project, providing better space and technology for some of Carroll’s most sought-after programs. The facility follows the opening of Jaharis Science Laboratories in 2016. Certified LEED Silver, the building features demand control ventilation utilizing occupancy sensors and CO2 monitors to greatly reduce the building’s expected energy usage — a particularly helpful feature in a building that requires high ventilation rates for multiple lab environments. Additional sustainable strategies include the reduction of estimated water usage by 44.8 percent, LED lighting tied with daylight harvesting, and the use of thermally efficient windows. The green roof, itself, helps manage stormwater runoff, reduces the heat island effect of the roof, and provides pleasant green space next to the rooftop patio. Occupants of the patio are treated to a view of nature paired with Carroll’s iconic terra cotta roofs and buff stone exteriors. The third phase of the campus redesign project — the interior renovation of Rankin Hall — is currently pursuing LEED v4 BD+C Major Renovation. With more than 40 LEED accredited professionals currently working at BWBR, the firm is one of the leading advocates for sustainable performance design, incorporating green design strategies into complex environments like academic facilities, R&D centers, and hospitals. As part of a global movement to design smarter, BWBR signed the AIA 2030 Commitment in 2014 which challenges architects and engineers to make buildings carbon-neutral by 2030.